I’m passionate about 3 things; painting, photography and travel. Rather fortunately, in my world these days, they all go beautifully together. I love the feeling of waking up in a new place and wandering the streets, camera in hand, to capture anything unique and new to me. Whether I photograph them purely for photography’s sake, or use later in sketches or paintings, I never know at the time, but these photos are a constant source of inspiration and reference to me wherever I am. 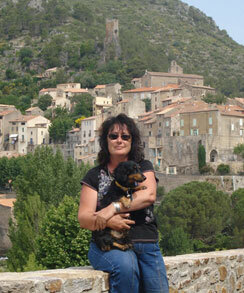 Jackie is originally from New Zealand and has spent most of her adult life in Sydney and London. Her works have been sold both through galleries and privately in Australia, Europe, Canada, USA and New Zealand. 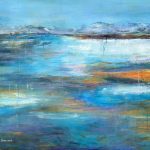 She developed her love of painting under the mentoring of well known Sydney artist, Sarah Aylward, and is now dedicating more time to painting whilst living in Europe. 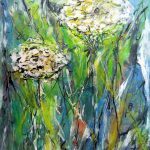 Jackie enjoys painting in a wide range of mediums – from her earlier paintings in watercolour, ink and pastel, to her more recent work in acrylic, concentrating on colour and texture and often incorporating ink, charcoal and collage. She is also a dedicated photographer, and is enjoying experimenting with the use of her many photographs in her paintings. Jackie spends many months in Greece each year, where she continues to work to capture the atmosphere of the changing European landscape, the seasons, and the villages and houses. She returns to Sydney frequently to visit family, friends and to exhibit her works.